The Lodge building was erected in what was first known as Hutchinson Lane, but about the time it was paved (1754) it became Daggard Lane. Nowadays it is Dagger Lane. The land was leased from a nearby Swedenborgian Chapel. Originally only the first floor was used for Masonic purposes: downstairs it was a slaughter house at one time, and later a warehouse. Now the building is used in its entirety: the ground floor has a kitchen, dining room, bar and other essential rooms. It is the oldest purpose-built Lodge Room in this part of the country –the place has been in constant use since 1804. The oldest Lodge in the area is the Minerva Lodge, and there are honours boards with the names of Minerva Brethren going back to 1783. There have been renovations: the old spiral staircase is no longer in use, for example, furnishings have been replaced, etc. : the Lodge Room was declared a protected building in 1986. Currently, five Lodges meet in the building, along with various Chapters and other Orders. Entering through the curved doorway perhaps the first thing one might notice is the chequered flooring. Facing you is a huge semicircular arch, which is supported by two pillars one at the North wall, the other at the South. The arch divides the dais and the main body of the Lodge Room. The sky blue ceiling curves down to the cornice. The half dome over the dais also has a sky blue ceiling. The All Seeing Eye of the Almighty is painted above the arch, and beyond, there’s another, set in a large gilded boss, with a great fan of rays shining on the Volume of Sacred Law with the familiar Square and Compasses. 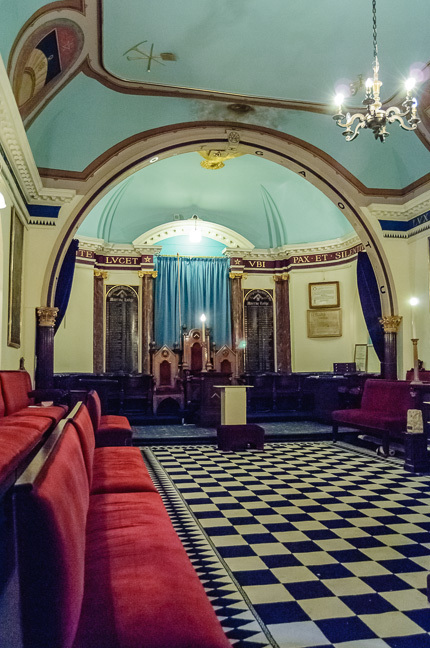 The Ionic style pillasters reaching from the floor to the cornice on the dais frame the Victorian chairs for Worshipful Master and other distinguished Brethren. 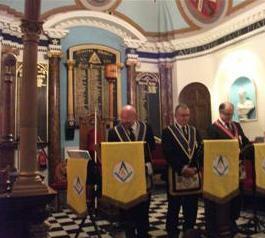 The familiar Masonic pillar theme is reiterated on the west wall, on some of the chairs and elsewhere. The Master’s and the Wardens’ chairs –with their rich red upholstered seats and backs and carvings of winged cherubim supporting the arms, are modelled on those of Grand Lodge, which in 1783 met in York. The seats on the dais in the East are fixed to the wall, rather like canons’ stalls in a cathedral with their curved backs and projecting arms. Large tracing boards of the three degrees and of the Chapter are on open display, though time has darkened the varnish to make the details difficult to discern. There are Latin inscriptions as a frieze round the room: in the north –Audi, Vide, Tace – hear, see, be silent; Fiat Lux et Lux Fuit – let there be light and there was light; Quaerite et Invenietis – seek and ye shall find. Above the dais: Lumen Ingens Oriente Lucet ubi Pax et Silentium Regnant – A great light shines in the east where peace and silence reign. On the South wall: Lux Lucet Tenebris sed Tenebrae non eam Comprehenderunt – the light shines in the darkness but the darkness comprehendeth it not. Above the cornice separating the walls from the ceiling are paintings of large shields indicating aspects of Freemasonry practised in Hull from the earliest times. There’s the head of Minerva, the arms of the Premier and Antient Grand Lodges, and of Mark Grand Lodge, two of the Ancient and Accepted Rite, and of Knights Templar. In the corners of the ceiling are the sun, the moon and stars, a skull and crossbones, and tools used in the Chapter degree. There is the letter G in the centre of the ceiling above the chandelier. Of note is the magnificent organ, a Forster and Andrews instrument, lovingly restored in 2011 by the international Organ recitalist Paul Derrett. Forster and Andrews were local organ builders and examples of their work can be seen all over the world. Some pipes are decorated with the square and compasses sign. A picture of the Forster and Andrews workforce hangs just outside the door to the Lodge room. 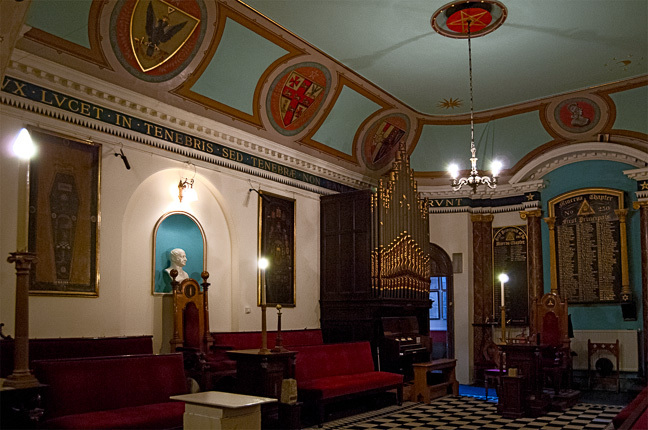 A rare feature in Lodge Rooms are niches with busts: there is Lord Zetland, MWGM, a significant figure in the development of Freemasonry in the north of England in the second half of the nineteenth century. This bust was created by Bro. Thomas Earle, whose son-in-law, Frank Appleyard, seems to have been the man responsible for the design of the original Lodge Room. There’s a bust of Appleyard himself just behind the Junior Warden’s seat. The other figures are of Worshipful Brother Charles Wells, who was Master of Minerva Lodge in 1853, and of Lord Worsley, who became Earl of Yarborough and was the Right Worshipful Deputy Grand Marshall between 1846 and 1856. There’s also Dr John Bell sporting an enormous beard. What originally was the upstairs dining room has been converted into a second Lodge Room, known as the Red Room as the carpet therein is that colour. It is used for Knights Templar meetings and other degrees. There is interesting statuary and furniture, and further honours boards, warrants, etc. Also upstairs is the Interview Room lined with pictures of the Past Masters of the Minerva Lodge. On the staircase walls and downstairs are oil paintings of distinguished Brethren of past years. The dining room is now downstairs and there is also a comfortable bar area adjoining it. Both areas have recently been refurnished with new flooring.